Two world-class performance troupes take the mainstage at Conexus Arts Centre on August 20th ... DON'T MISS THIS ONCE-IN-A-LIFETIME opportunity! 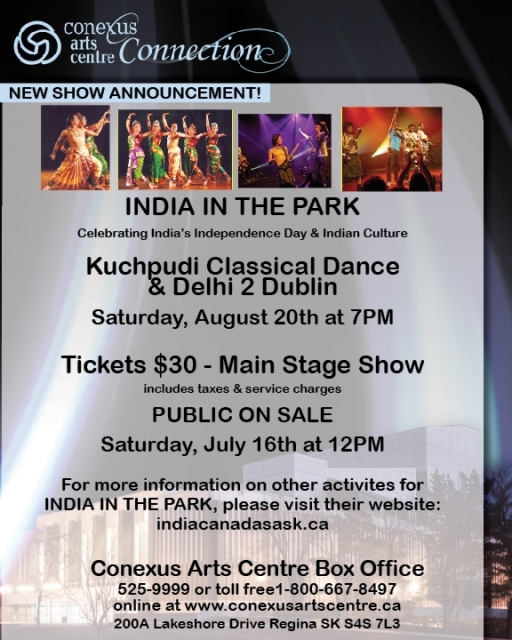 As part of the special celebrations to mark India's Independence Day, ICA is excited to bring you Vancouver's Delhi 2 Dublin and a colourful Kuchipudi classical dance troupe from India. This rare performance is part of the Year of India in Canada 2011. Already a hit with fans thanks to their infectious performances, Delhi 2 Dublin leaped to pan-Canadian fame after wowing crowds on Parliament Hill during the televised 2011 Canada Day celebration. Tickets are only $30/each and available from the Conexus Arts Centre Box office or buy them online. Help promote this event by "sharing" the event page on Facebook. ABOUT DELHI 2 DUBLIN -- Blending east and west, electronic and acoustic, mainstream and underground, Delhi 2 Dublin is the new sound of music. The five member D2D crew takes you on a wild and borderless trip, fusing traditional sounds of tabla, dhol, fiddle, and sitar with cutting edge DJ aesthetics. Don's miss their highly charged multi-cultural music and dance show. Preview the show at Delhi 2 Dublin's youtube channel. ABOUT THE KUCHIPUDI DANCERS -- This award-winning troupe from India has garnered praise from audiences around the world for their colourful and mesmerizing performances. Led by Kuchipudi maestro Guru Jayarama Rao and Vanashree Rao, one of the most celebrated couple of this art form, the Kuchipudi Dancers have performed all over India and in almost every major national and International festival around the world, including the USA, Europe, Latin America, Japan, Portugal, Afganisthan, and Fiji. The Anghaar Kuchipudi Dance Academy was established in 1973 to preserve and promote this classical art form. The Academy is committed to maintaining the highest standards and to passing on this art to the next generations. Check out these photos of the Kuchipudi Dancers in performance.